Mexican Pork Carnitas cook without heating up the house and the whole family will love this delicious pork dinner! Great idea for Taco Tuesday don’t you think? 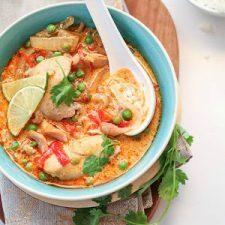 And you can make this in the Instant Pot or the Slow Cooker, so choose the one you prefer. Click here to see The BEST Slow Cooker Pork Carnitas from Food Bloggers! Click here to see The BEST Instant Pot or Pressure Cooker Pork Carnitas! 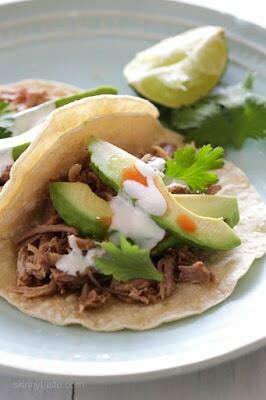 I consider dishes like these Slow Cooker Mexican Pork Carnitas from Skinnytaste to be the perfect thing to cook in your slow cooker any time of year. 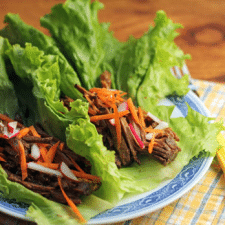 Not only does it cook all day without heating up the house, but you can use the flavorful shredded pork in things like burritos or tacos, which I think still taste great no matter what the weather is like. Gina suggests using the boneless pork shoulder blade roast for a lighter version of this Mexican classic, and the cooling avocado is a nice touch. This tasty way to cook pork was first featured in 2012, but now fast forward to 2018 and you might want to cook the Mexican Pork Carnitas in the Instant Pot (or another electric pressure cooker) if you’re rushed for time. If so use this link for the pressure cooker version of the recipe! And let me know in the comments if you’d like to see more recipes here that will work in either the slow cooker or the Instant Pot! Get the complete recipe for Slow Cooker Mexican Pork Carnitas from Skinnytaste. If you’d like to make this recipe in the Instant Pot, use the Instant Pot Pork Carnitas recipe on Skinnytaste for instructions for that! I've been using my slow cooker this summer to make (and shred) all sorts of dishes like this. Then, I pack into small portions and freeze, to serve in tortillas, wraps, or over rice or salads. Lydia, you are turning into the slow cooker expert, no doubt about it! I love using the slow cooker like this as well!